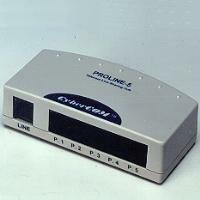 The proline-5 is an easy to use five ports automatic switching and line sharing device. That allows several telecommunications device to share the standard telephone line. Only one device has private and exclusive use of the line. Recommended use in a home office use one line for the Internet, and Fax / voice calls; in a retail shop attach to a credit card reader for quick credit checks. One telephone line can be used for 5 different telecom device, only one device can use the line at the time; but that device will have prive use of the line. No power source is required. Calls are handled on a first out basis.